Robert Morgan Fisher was born in Austin, Texas. His father was a Naval Flight Officer, so the Fisher family spent time in California, Washington State, Ohio, Virginia and Florida. Robert returned to The University of Texas at Austin where he began performing music in bars and coffeehouses. He soon migrated to Los Angeles where he put his Radio, T.V. and Film Degree to work in various jobs including executive/production assistant, composer/arranger, announcer and finally as a writer of scripts, music, comedy and fiction. His career experience includes years of teaching writing, Fiction Editor for the Antioch Literary Magazine Lunch Ticket, Improvisation with The Groundlings, Specific Hospital, Music Director for Second City's Totally Looped and he served as Associate Director of Writers Boot Camp in Santa Monica for twelve years. 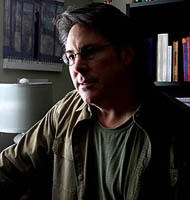 Robert holds an MFA in Creative Writing from Antioch University. In 2017, he joined the faculty of Antioch University Santa Barbara's Low-Residency MFA program, teaching Fiction, Creative Nonfiction and Screenwriting. He also develops courses and teaches in their online I2P program. In the spring of 2016 UCLA hired Robert to lead the Wordcommandos Weekly Creative Writing Workshop at the West Los Angeles VA for veterans with PTSD.